Bel Air is a mostly residential neighborhood, consisting of magnificent gated estates far from the road. Bel Air was designed for privacy; there are no sidewalks to discourage pedestrian traffic, and the roads are narrow and winding. I was driving around in the Bel Air neighborhood, and the only place I found to pull over in my car was a construction site. When I got out of the car, I was treated to this amazing view of the city, with the silhouette of a construction crane in the foreground. It was a beautiful scene that I knew I had to paint. 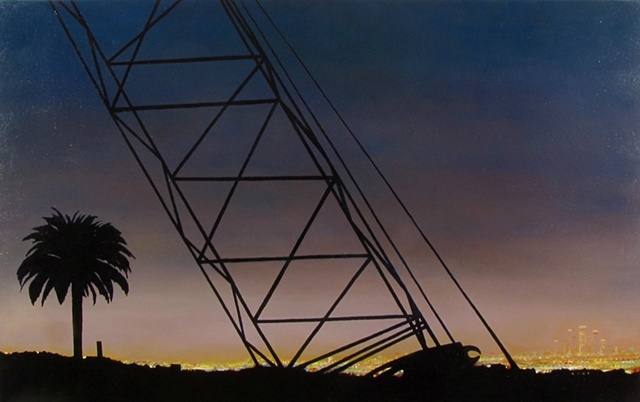 This painting is my most recent exploration into the natural beauty of Los Angeles, and the vista is definitely unique to the area. The Los Angeles basin, a vast uninterrupted area of development on a flat plain, turns into a beautiful sea of twinkling stars at night.